Korg's Highly Portable, Battery-Powered Analog Bass Synthesizer! If you're looking for the deepest, fattest bass sounds available in the most portable, compact unit, then look no further than the Korg Volca Bass Analog Bass Synthesizer. The Volca Bass is an entry-level analog synthesizer designed with bass synth production in mind. Despite its compact form factor and portability, the Volca Bass offers true analog circuitry, allowing for those rich, fat sounds you can only achieve with an analog synthesizer. Volca Bass is Korg's answer to bass culture and the demands of the modern, on-the-go musician. With the built-in speakers and the ability to operate via battery power with up to 10 hours of use from per charge, you'll be taking your bass with you, wherever the road may lead. Of course, it's equipped with a headphone jack and the built-in speakers will automatically deactivate when headphones are connected, so you can immerse yourself in bass anywhere you like. And since the unit weighs less than a pound, lugging the Volca Bass won't weigh you down either. The Volca Bass supports three-voice polyphony and a full envelope/filter section, providing you immediate access to a multitude of bass synth sounds. Settings can be easily dialed in using the provided knobs and everything is right in front of you, so generating thick, original sounds will be intuitive even for new users. 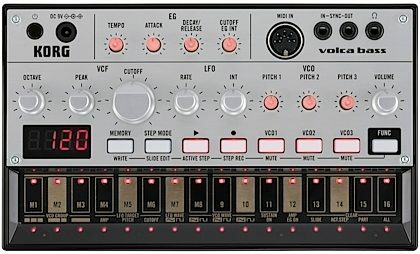 What's more, Volca Bass is not just a synth, it's also an Electribe-inspired 16-step sequencer, with onboard memory for storing 8 of your favorite patterns. Volca Bass can easily integrate with other Korg Volca synths via the provided Sync In/Out port. Volca units may also be integrated with your existing DAW or MIDI environment via the provided MIDI port. Whether you're looking for your first synthesizer or looking to add some bass to your existing EDM studio, Korg's Volca Bass offers a remarkably affordable bass synthesizer in a surprisingly portable analog unit. 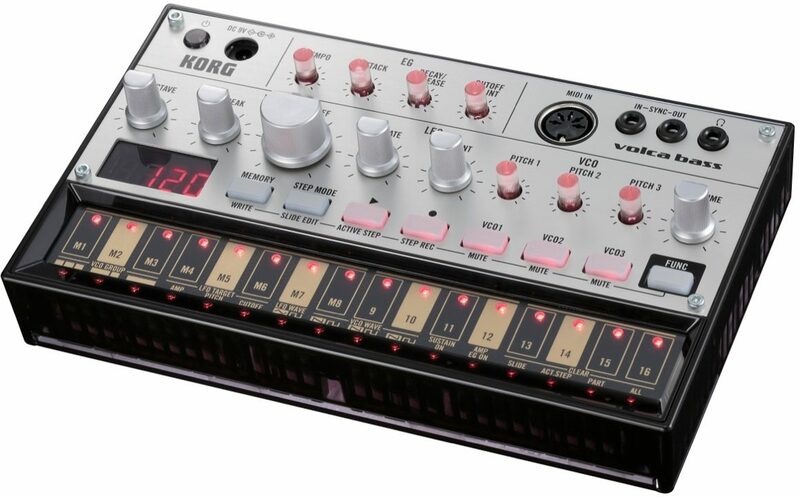 The Korg Volca Bass synthesizer is part of Korg's Volca series -- a lineup of EDM production tools that also includes the Volca Keys lead synthesizer and Volca Beats rhythm machine. Following in the footsteps of the monotron, monotribe, and MS-20 Mini analog synthesizers, these powerful and fun-to-use true-analog devices deliver a diverse array of fat sounds that can be obtained only from an analog synthesizer. Each is also equipped with sequencing/recording capabilities for intuitively generating performances. Multiple Volcas can be used in tandem via the vintage-style sync in/out, and with your favorite DAW software or MIDI keyboard via MIDI In. Battery operation and built-in speakers mean that you can conveniently play anywhere and anytime. These are the next-generation analog synthesizers, bringing you the ultimate sounds and grooves with ease and depth. Whether used together or by themselves, the volca series is poised to inject true analog power into any performance or studio setup! Aggressive sounds that stand up to the drums; fat sounds that support the rhythm; funky sounds that generate a groove - the volca Bass is an analog groove box that has what you need for a wide range of bass lines. Note: KA-350 AC adapter is optional (not included). Can run off 6xAA batteries (not included). "Not an Electribe or a monotron duo, but"
Overall: This is a great bang for the buck.. Cheap yet powerful analog synth with sequencer and MIDI. Amazing low-end and squealing highs.